So first off, GenCon was amazing. This year was my 2nd, but my first as game designer. Beyond meeting loads of awesome people, I ran the hell out of Headspace! Headspace at Games On Demand! 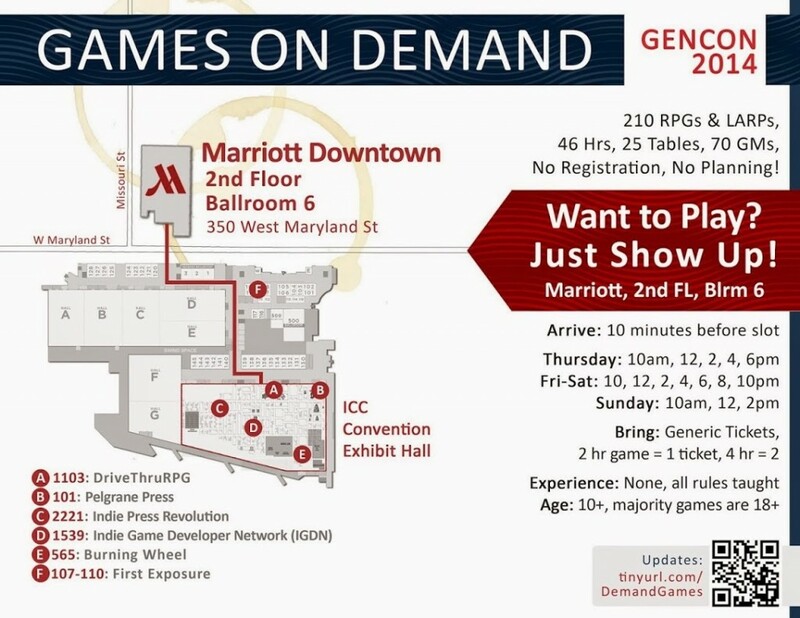 I ran 2 x four hour games at Games on Demand, 1x four pickup game in the Embassy Lobby and a further 2 x two hour games at the IGDN room. My good friend Jason Pitre (Genesis of Legend Publishing) also ran a 2 hour game on my behalf. In all over 25 people got to play, and as best as I can tell everyone had a lot of fun. All of the games use the same rough scenario of rescuing a technician and her family from a Corporate compound (all with varying degrees of success). John Adamus, Kristyn Bitner, Sam Carter, Daniel Crawford, Alan Duffy-Guy, Shawn Fiedler, Lowell Francis, Nick Guidotti, Andrew Van Hise, Nicolas Hornyak, Andrew Landford, Aaron Lehmann, Brian A. Liberge, Lisa Matincik, David Morford, Dylan Van Pelt, Ryan Perrin, Tasha Robinson, Ruth M. Scheller, Dustin Simeone, Ericka Skirpan, Todd Willey, Colin Woodward, Amanda Valentine, Clark Valentine. If I miss-spelt your name please let me know! 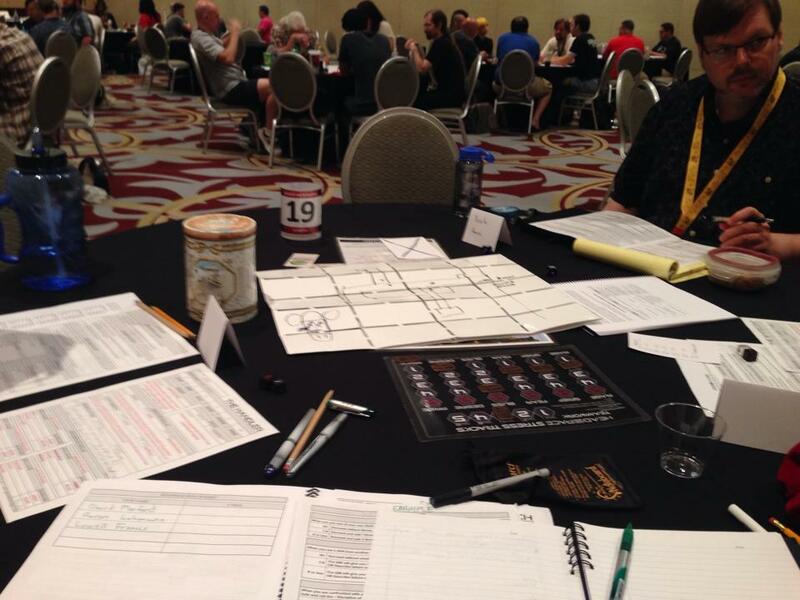 I’d also like to extend a special thank you to Dustin Simeone who ran my Dreamation rules for his friends and who all came out to try at GenCon! So besides paying careful attention to what some of the mechanics did in play, I spent a lot of time examining the flow of the “Stress Track”. The game does cinematic action against “mooks” very well, but I need to see how it works in long play, slower play and against equal caliber corporate agents. I went through a round of Roses and Thorns with every play group and I’ve been pondering over changes and ideas all week since GenCon. My preferred method of sorting out ideas is to classify them as either : Implement Now or Ask a Question. Reduce Player Health Tracks to 4 (Characters can take a lot of punishment and since “Taken Out” is only death if the Player wants it to be, this seems to be more fair). Make the difference between Stun and Normal Damage clear. Professional Moves: New 12+ Success and Reduce Stress By 1 (Represent high rolls as allowing the Player to simmer the Headspace down). Headspace Moves: Remove the -1 Stress from 7-9 Rolls (It was causing the Stress Track to bleed out more than intended). Note that Armour Doesn’t Stack. Provide additional Character Customization options – Upgrades need to be more interesting/powerful. The Handler: Investigation and Observation are too much alike. Reset Regrets at end of Session (Everyone loved them and wanted them more, some tweaking to do this). The purpose of this is to reinterpret feedback and ideas into questions of “Should I do this?” to let me ponder and think about what the potential answers might be. Should all character Upgrades just be on a one big list? Can the group “upgrade” the Headspace, and how would that work? How should Hacking a Headspace work? How should character advancement work/should it? Group experience pools? Money? How should the internet, virtual reality be dealt with in play? Should there be a “blank” Hard Choice that the GM uses with appropriate scene elements? Should Psychology rolls lower stress? Should Stress Levels have any mechanical effects or just be about role playing until feedback happens? The fiction of Stress needs to be explicitly clarified (may just be me explaining the game better in some cases)? How do I note when one scene ends and another begins? How do I reset Regrets over long play? Can players burn teamwork to burn existing stress? (I don’t see why not). Well that was GenCon for Headspace! I’ve have some additional announcements in the coming weeks. I’m hoping to put together a few G+ Hangouts of game play and I plan on attending Metatopia 2014! The game has fleshed out substantially since Origins with writing contributions from Lillian Cohen-Moore who wrote large portions of the fiction for Chapter 1 and Chapter 5. Jason Pitre has contributed to the GM chapter and has taken a much more streamlined look at GM Moves in a World game. This game has also gone through two developmental edits from the Awesome John Adamus. Brianna Reed has contributed in the form of the mind boggling awesome new logo for the game. Myself and Jason Pitre will provide a survey of the indie game market, including personal recommendations on games to watch! SO YOU’RE MAKING YOUR FIRST GAME! I’m getting together with John Adamus to talk about our experiences working on our very first game design! Learn from a panel of first time game makers and industry professionals the perils, frustrations and strategies it takes to put together your first game from start to finish. Ready to jump in to your first design? Join Jason Pitre and other industry vets to talk about getting your first design off the ground!